It was less than a week ago that Israel Folau set a Super Rugby try-scoring record to cement his status as one of the greatest rugby players of his generation. But in an unprecedented episode, Rugby Australia is now on the verge of sacking their in-form full-back, just months away from a World Cup in which Folau would have been a central figure for the Wallabies. It comes after Folau posted on social media on Wednesday that gay people were among those who he feels would go to Hell unless they repented. Unless the 30-year-old has an acceptable explanation for his latest social media foray - and after meeting rugby chiefs on Friday they said their position remained "unchanged" - then he may never play rugby union again. Folau first found himself in hot water with his employers at Rugby Australia exactly a year ago when he made a similar post on Instagram. A committed Christian, Folau says he reads the Bible every day, as he outlined in a blog entry on the Players Voice in April 2018, where he sought to explain his stance and insisted he is not a homophobe. In this column, Folau referenced a passage from Corinthians, which bears resemblance to the most recent post which may have cost him his career. But while a year ago Folau's bosses at Rugby Australia said they accepted his position but did not support it, now they have moved a significant step further by making clear their intent to sack the player. This is almost certainly as a result of the first episode and its aftermath, with the Australian media reporting Folau had social media clauses in the deal he signed in October, which he has likely contravened with his latest actions. "Israel has failed to understand the expectation of him as a Rugby Australia and NSW Waratahs employee is that he cannot share material on social media than condemns, vilifies or discriminated against people on the basis of their sexuality," read a statement. Furthermore, while Rugby Australia was able to ride out the PR backlash last year and allow Folau to escape with a warning, the damage of doing the same this time around could have been costly both reputationally and financially for a struggling union. While the governing body will be praised for the decisive action, the financial damage of sticking by the player could have outweighed his sizeable input to the Wallabies on the field. For example Qantas, the Wallabies' primary sponsor, has voiced its displeasure at Folau's comments and made it clear it would support a hard-line stance. Since reaching the World Cup final in 2015 - with Folau a key performer - Australia have under-performed, and are currently as low as sixth in the World Rugby rankings. 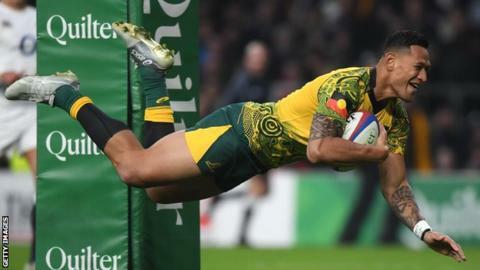 Folau - who has also played professional rugby league and Australian rules football - has consistently been one of the side's best players since his international union debut against the British and Irish Lions in 2013, so will be badly missed if and when his sacking is confirmed. The impact this would have on the playing squad remains to be seen, with some of Folau's team-mates 'liking' his post on social media - although this doesn't necessarily mean they support his views. But it leaves the Wallabies, and Australian rugby at large, in a fix, with a World Cup looming in which they face the likes of Wales and Fiji in a difficult pool. One bookmaker has already lengthened the Wallabies' odds for the tournament from 12-1 to 16-1. Head coach Michael Cheika and chief executive Raelene Castle now face an uphill task in repairing the damage being wreaked on the game down under, both on and off the field.